This New Modern House Ditch Road on a large isolated suburban landscape is free to be whatever it wants to be. This location across from Simon Estate has no neighborhood design review committees, nor are zoning variances needed. Just meet the Owner goals and zoning criteria and go for it. Owner expressed an interest in privacy, natural light, and Mid-Century Modernism. 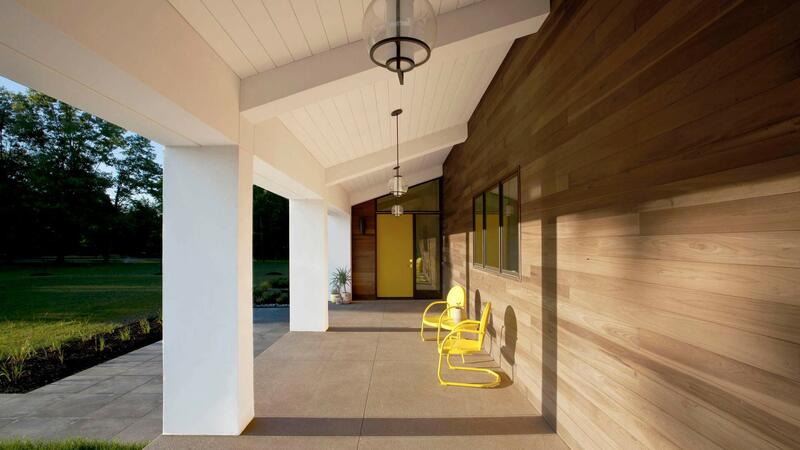 They referenced a few Midcentury design images they liked along with a few examples of courtyard-style homes that suited their taste. Most importantly they made it clear, “this is the last home we are doing, and we want to do it right”. The campus-style, courtyard-driven design solution for this home balances passive design opportunities with a multi-tiered program working to balance aesthetics and budget. Architect has defined each major program element placed with respect to beneficial adjacencies, solar orientation, views, access, and privacy. Front approach is low-key and private, with a sheltering front porch, offset front door, and smaller front windows. Upon entry, views open to the back courtyard and vaulted living space, with visual access to the bedroom and recreation wings framing the pool terrace and covered outdoor eating area. Main living core, recreation, bedrooms, art studio and garage all express independent volumes connected by a central axis. Overall architectural aesthetic is a blend of Modernism and rural agrarian form and material. This rear-view diagram above illustrates the linear axis connecting all portions of the plan. Owner will use the grain-bin studio to the far-right for gardening, painting, and metalworking. 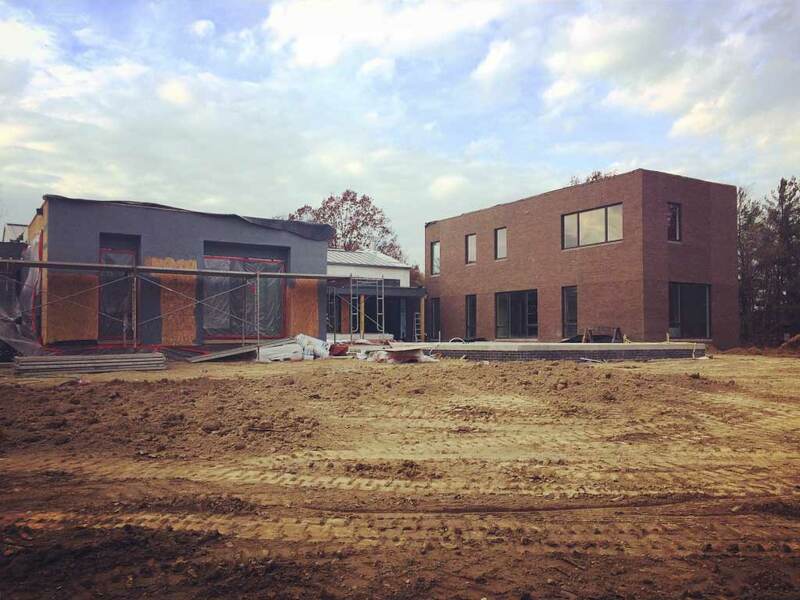 Studio will be part of Phase Two after move-in. Please check back for updates as we will be adding to the story. After many months of planning, we are excited to finally be breaking ground in late fall 2015. The photo below views progress from back-yard. Lower right of photo is the pool-deck, and the front left-side space is the Recreation Wing (pool house). Far upper left is the 3-car Garage. Pool Deck originally faced south southeast, but in a last-moment decision, Owner decided to turn the orientation. So, builder turned the footprint about 55 degrees counter-clockwise so pool deck would face the back woods – almost directly east. 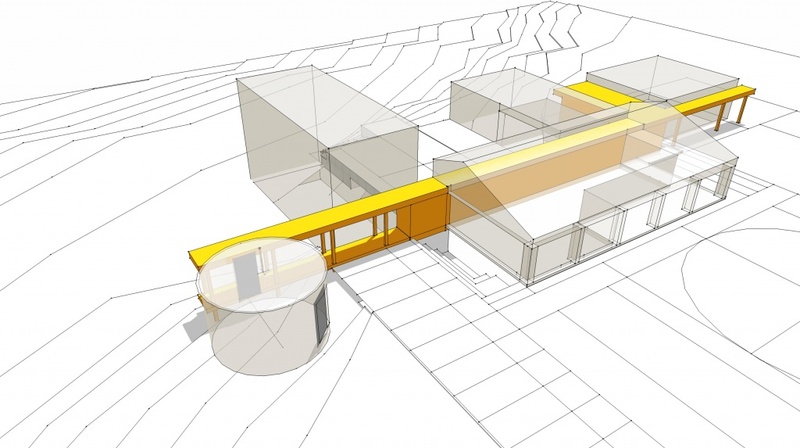 The house was designed to take advantage of the south passive solar light. And we also took into consideration that we maintain enough privacy from the property to the south. So, we are watching closely how this adjustment may affect the interior quality of light. 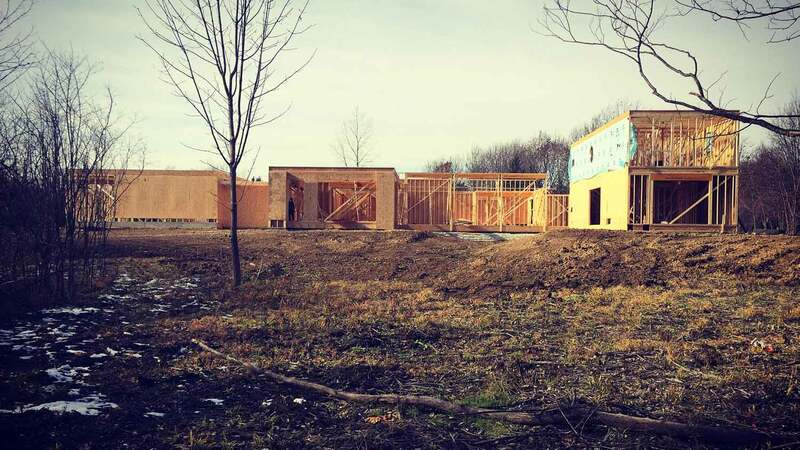 This framing-progress photo below is during mid-November 2015. It’s always fun to see the bones taking shape in built form. Things seem to be just as we had hoped from a scale, proportion, and interior volume standpoint. Computer modeling has made things so much more accurate in communicating the design. This ease translates to us, our clients, and the construction teams; less surprises and design-misunderstandings. 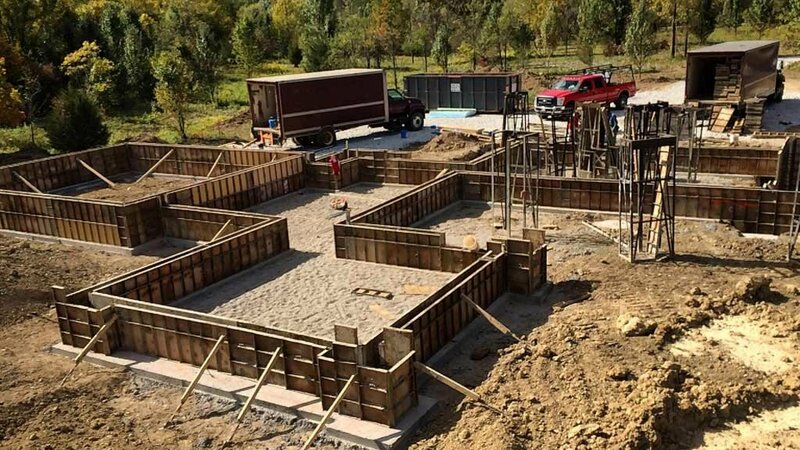 This house is stick-frame (2×4 walls) on 8″ thickness concrete foundation walls – based on builder/crew familiarity; and therefore, cost. The unique window/wall design in the architectural stair is partially a result of HVAC system integration. Vertical chase feeding from lowest-level is to the left of these stair windows. Horizontal duct runs feeding the three floors of the bedroom wing run horizontally between the windows just below respective floor structure for each floor. 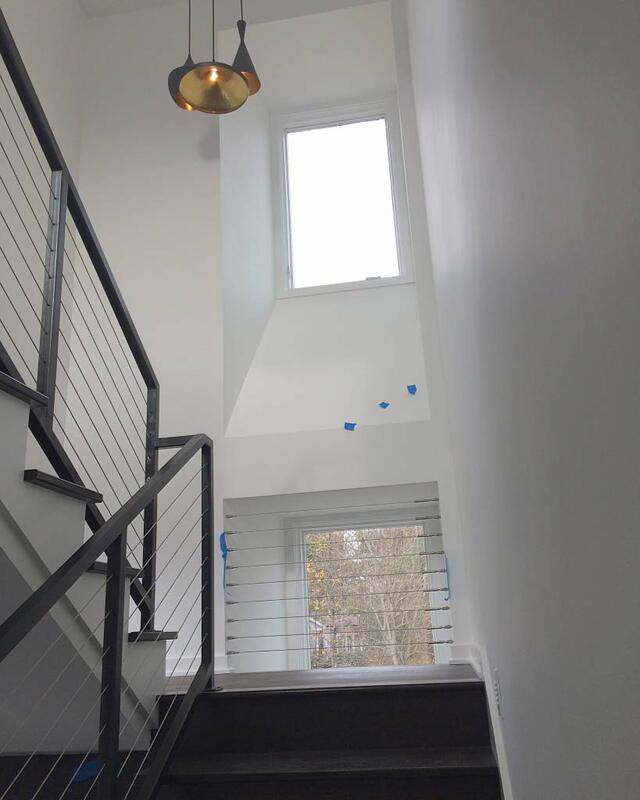 Sloped window sills bring more light into the stair space, with an aesthetic nod to LeCorbusier’s, Notre Dame du Haut. 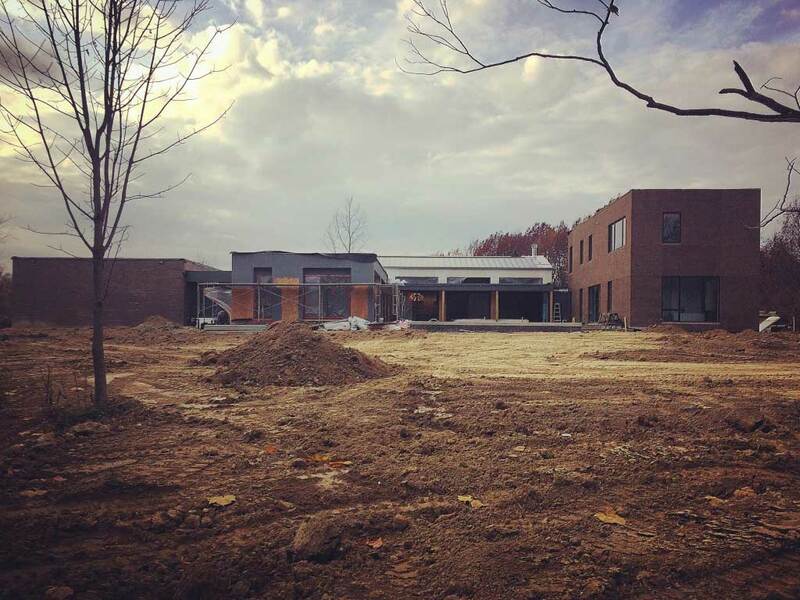 This photo from the back in early summer 2016 shows infinity pool and exterior siding/roofing progress. 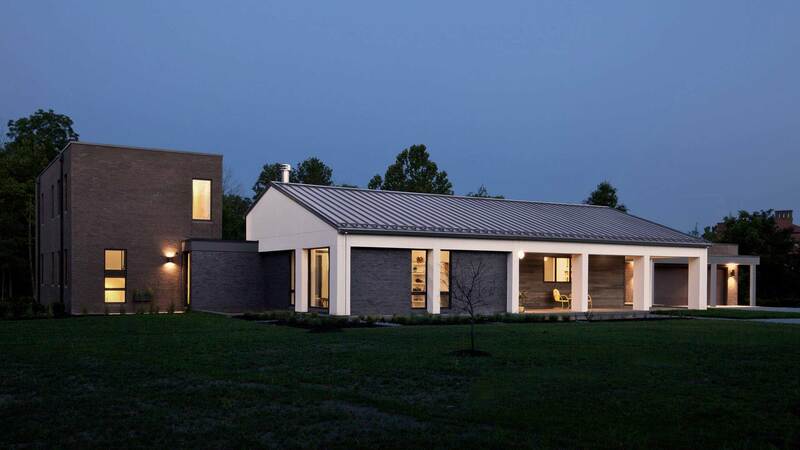 Modern homes like this with a sophisticated mix of exterior cladding and roofing materials take more design, detail, and coordination. And certainly as compared to the norm, a project like this takes a more commercial level of precision. The clean lines make imperfections more noticeable. So in many ways, “simple” can be more difficult to achieve. Brick-cladding on the bedroom wing to the right is nearing completion. Notice the subtle accent/texture in some areas of the brick. We achieved the variation with raked mortar joints in these areas adjacent to concave mortal joints. This was an effort to find the right balance of detail and simplicity. The siding areas to the left will be primarily pre-finished cement board rainscreen walls. This material is not common and requires a fair level of craftsmanship. Build team will install these panels later in the process. Outdoor Covered Lounge/Grill Area (to far left inside corner) will have a wood ceiling and back wall. This photo below shows status of the main living space viewed from the Kitchen area as trim carpenters have taken-over. 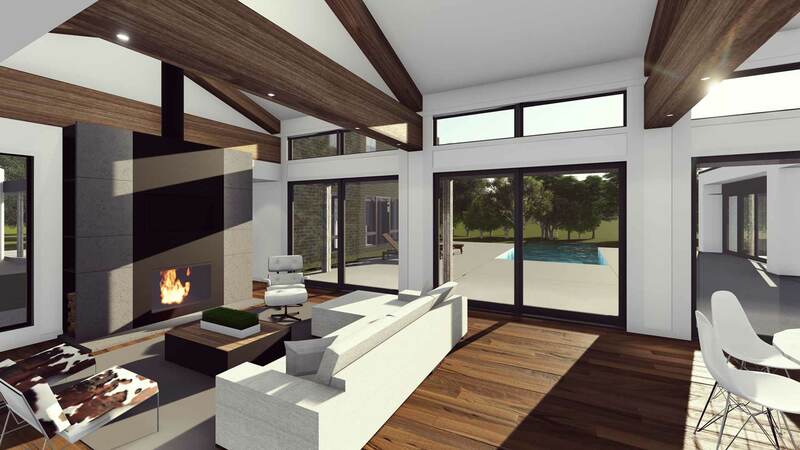 The big sliding-glass doors and transoms are long lead-time items and will arrive in a few weeks. Initial concept for the interiors included light to medium-gray large-format tiles. These tiles would reflect light and absorb warmth from passive solar in winter. 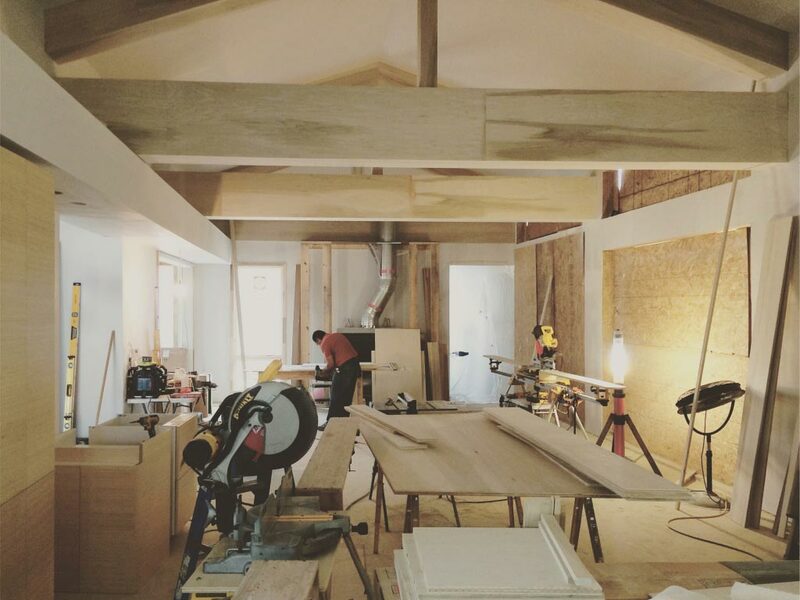 We designed trusses in white-painted wood, with a wood ceiling to add warmth to the space. Kitchen cabinets were to be rift-cut white oak door fronts, with exposed white cabinet boxes. Up to this point, Architect led the exterior and interior design concepts, in collaboration with Owner and build team. During the design process, some of the original decisions evolved on-the-fly. Owner preferred wood flooring over tile, and selected a semi-dark stained species. Since floors changed to wood, we modified living space ceilings to white-painted drywall. Large trusses changed from white to stained wood to match floors. 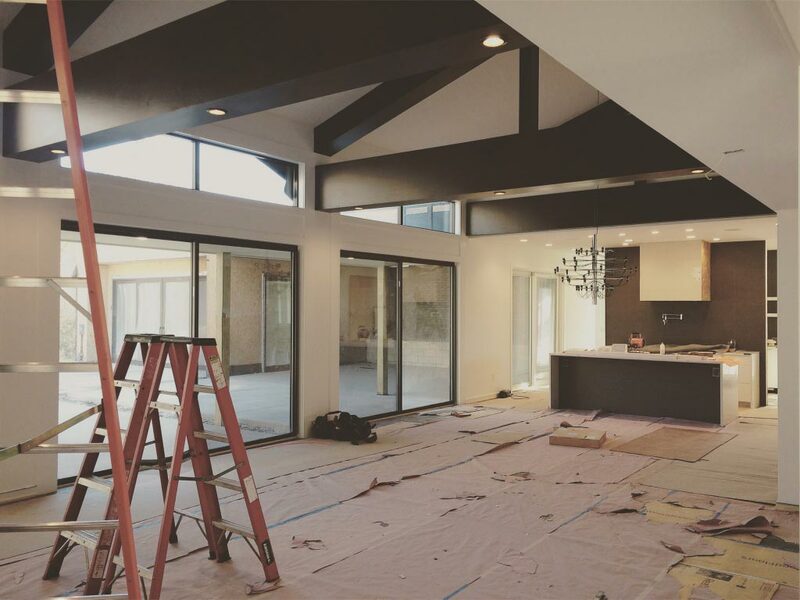 We are not sure if the darker floor and trusses will adversely affect the lightness of the space. However, we believe the new modified interior renderings and lighting scheme look nice. Overall, the original interior architecture concepts are true-to-form. The details are on-track and the cabinetry is true-to-concept. Original rift-cut white oak cabinet doors changed to light bamboo. Owner deals in office furniture where white oak is very common and didn’t want white oak in their home. We are hopeful that the bamboo will help achieve the desired, timeless vibe. 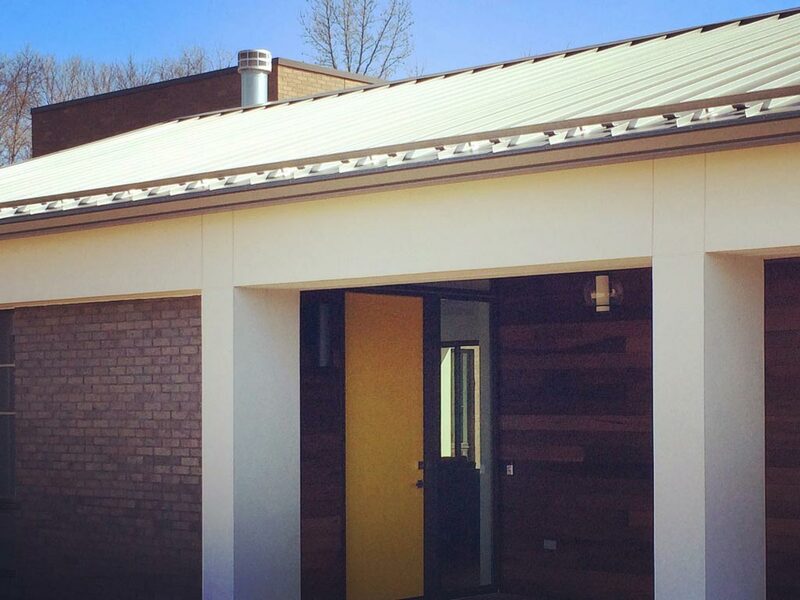 After exploring a number of exterior cladding options, we ended-up with a bit more brick and a bit less cement-board rainscreen than planned. The brown brick in the left-side bedroom wing is as per original concept. 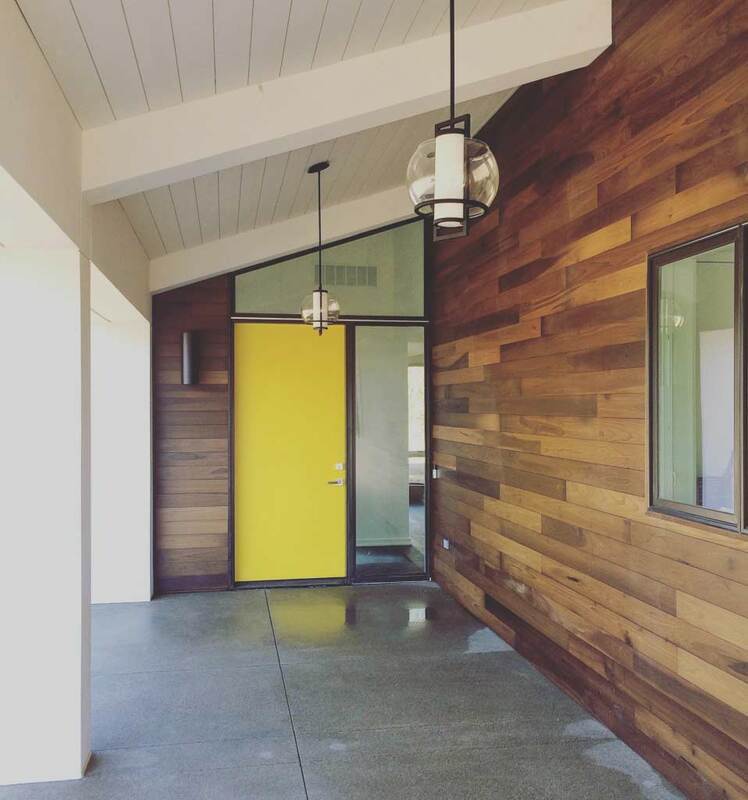 But client preferred to swap-out the original dark-gray cement board for the warm-gray brick. Early in the design process, we explored ultra-high performance concrete panels for exterior cladding. However, this technology is extremely expensive. Later, we defaulted to CBF, parts of which were replace with brick per photo below. From a conceptual standpoint, it was important to us to do everything we could to maintain the design integrity of the original cladding parti. Dark brick replaced original grey concrete panels to save cost, but we were able to mostly maintain the vision. During construction, the team still needs to make a number of interpretations and decisions. And as originator of the design concepts, the Architect should be the primary point-of-contact to help fill-in the blanks along the way. Sloped roof above is standing seam metal in a preweathered galvalume finish. This color is affordable, and is as close as you can get to a zinc-look for the cost. Black Reveal-Shield is an open-joint rainscreen systems as the WRB (weather-resistive-barrier) behind the final exterior wall cladding. Vertical black strips are composite battens with rubber strip gaskets to mount the cement board rainscreen system. Architect specified a flashing component to transition between vertical and horizontal panels, but it it not present in the mock-up. This photo shows the initial cement-board mock-up for Owner and Architect review. 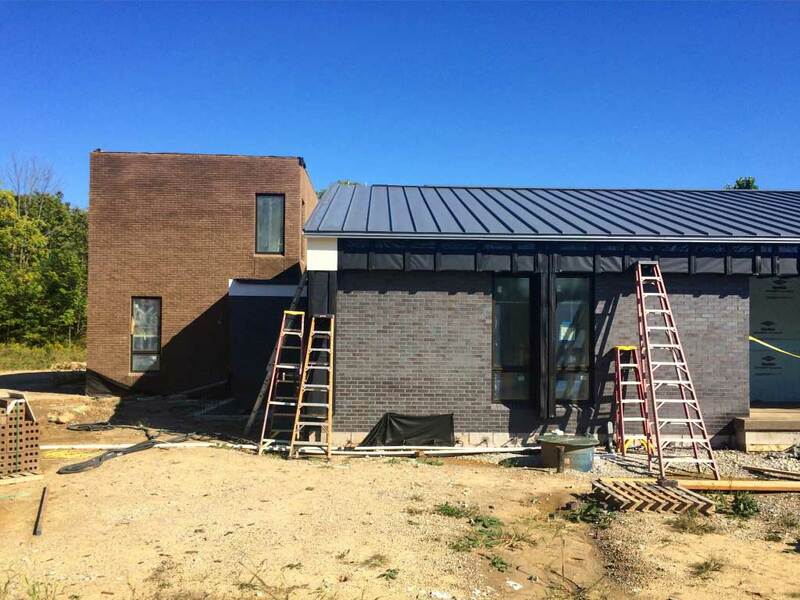 In late summer 2016, it was finally time to install the cement-board cladding as we did successfully at Copperwood (where we served as Construction Manager via WERK | Building Modern). But with this Ditch Rd project, builder expressed concerns about the tolerances and difficulty of some of the details. This photo above shows the initial builder mock-up. White panels are CBF cladding. The black weather-resistive barrier keeps water out. The vertical channels provide a mountable surface for the panels. We had discussed flashing at the vertical-to-soffit panel transition that had not been installed in this photo. Joints between panels are 5/16″. Since reveals are black, the contrast between black and white require a fair level of precision. The details for this project were a bit more complex than those at Copperwood. And according to builder, labor costs were going to be higher than anticipated. In discussing complexities and alternatives on-site, the team reviewed cement board vs the idea of using stucco instead. HAUS firmly pressed to proceed as planned with the cement board, and agreed that some areas could use larger pieces. 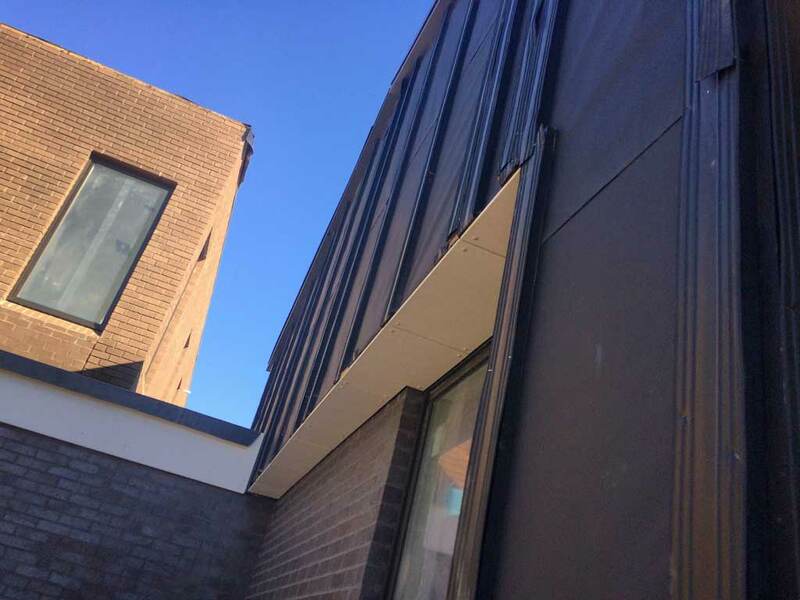 We felt this system would achieve the intended technically-refined, low-maintenance, water-managed cladding solution. Although it is not an industry expectation, Owner expressed a desire for absolute perfection. Builder was not confident that they could achieve a high-enough level of precision to meet that request. Architect tried to convince all parties that the the minor variances were still going to allow for an excellent outcome. We had agreed on this material and detail 18 months prior, with builder design process participation. However, the team abandoned the CBF material in-favor of EIFS. Owner and Builder were concerned potential joint alignment imperfections, even if within accepted tolerances, would be a long-term disappointment. Earlier in the design process we had explored stucco as an option. But at that time, Owner had ruled it out due to water-intrusion issues that the EIFS product had in their previous neighborhood. Many improperly-detailed, non-water managed EIFS projects were failing in the residential industry at the time. Owner decided on Stucco/EIFS to clad all the white siding areas instead of cement board. So, builder removed all of the cement board WRB and battens in favor of a stucco system. We didn’t agree with that decision, but the builder said he would eat the CBF costs. This made the decision easy for Owner (much to Architect’s dismay). 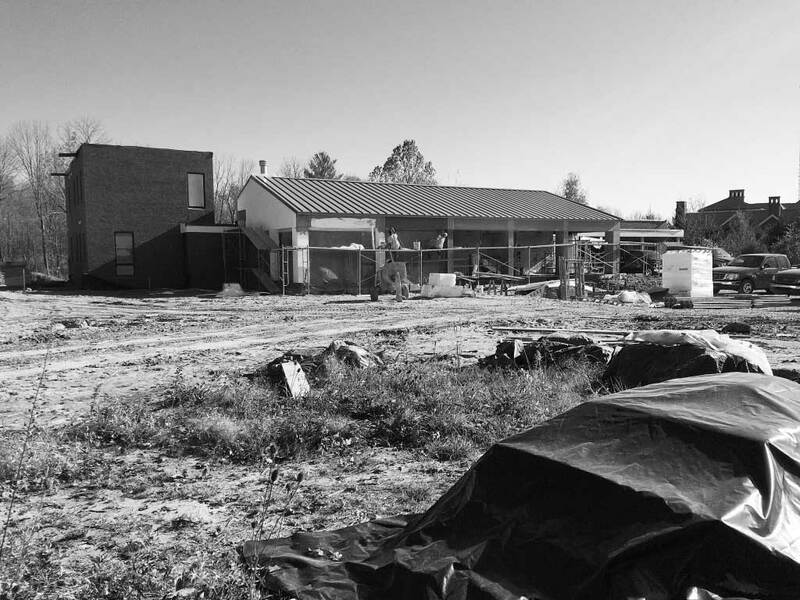 Months later, we learned that Owner held Architect accountable for their decision to change course. Since then, architect has felt fall-out from that particular chain of events. Builder removed the unused panels to Owner warehouse where they may still be sitting unused. “Anyhoo”, we pushed for the smoothest sand-finish EIFS possible with the new direction. The goal with this finish was so to most closely resemble real portland cement stucco. We always recommend water-managed wall-cladding systems no matter the material. However, it seems the build team may not have used a water-managed system here. EIFS installer placed sealant at all column base concrete porch conditions. So, it appears there is no way for water to weep out of the wall system if it gets in. We were able to advise on all the joint locations to somewhat realize original design integrity. Standard v-groove EIFS joints give some detail in lieu of a more complicated extruded aluminum profile integration. Some of the EIFS details vary from design intent, but overall, the team achieved the look. More reflection and time will tell if stucco/EIFS was a good choice. More architect involvement during construction is never a bad idea. For this reason, we always push to function as architect, interior designer, and builder on our best design projects. See the story why at WERK | Building Modern. 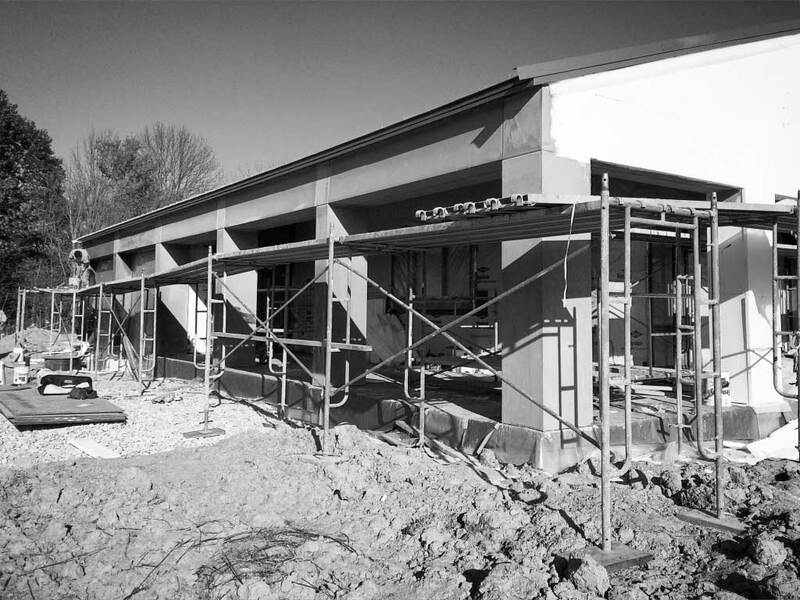 We prefer to take the lead in the design-build process beginning-to-end. 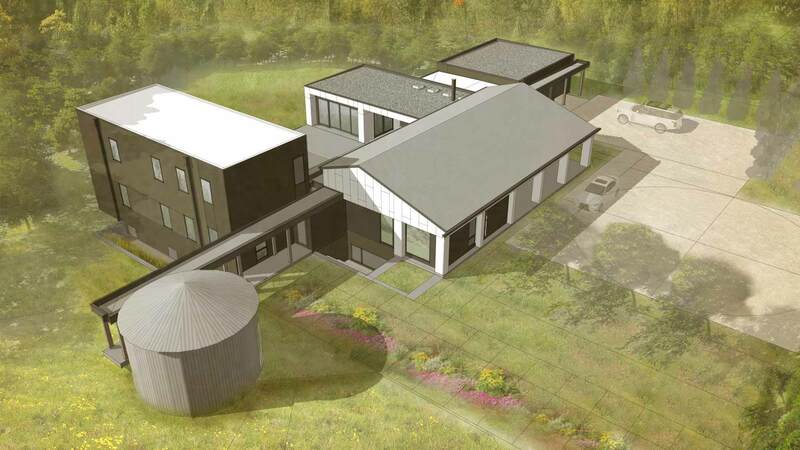 With this process, architect leads the coordination of ongoing field construction decisions and alternatives along the way. Design-by-committee or redesign and reconsideration of design-intent during the construction phase without Architect oversight is a precarious road to take. This especially applies for a project like this (modern, commercial level of detail). However, the team dynamic and client-priorities may dictate a different approach. The Owner still plans to build the studio as a future Phase Two. This studio will be a great feature for the owner. Also, it will complete the architectural composition by helping achieve visual balance and also softening an otherwise angular design. See the renderings, especially the aerial view. 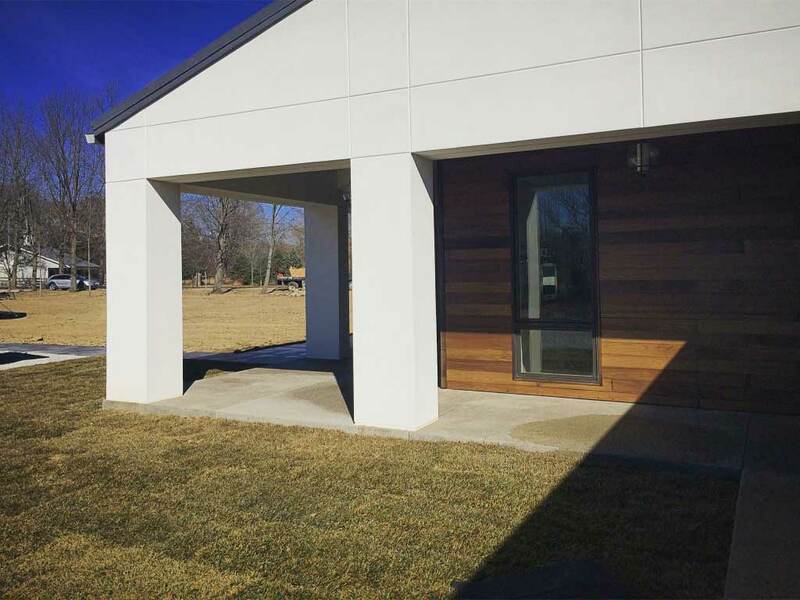 The front facade and front entry porch (photos above and below) exhibit an understated, horizontal form. Repetitive columns frame the porch, entry, and study. Restraint and privacy trump opulence and grandiosity. This front living core is the central space from which all other wings radiate. The main gutter is to extend beyond the facade on each side and have a chain downspout to landscape. These photos of rear exterior cladding progress are from late fall 2016. 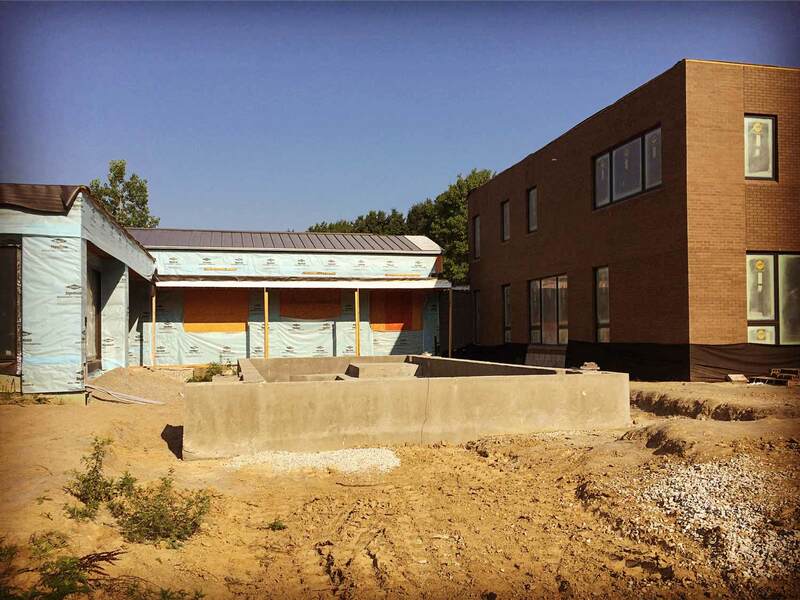 Rough grading was underway and exterior stucco was in-process. Overall, things are coming along well, and it is exciting to see the final touches coming together. 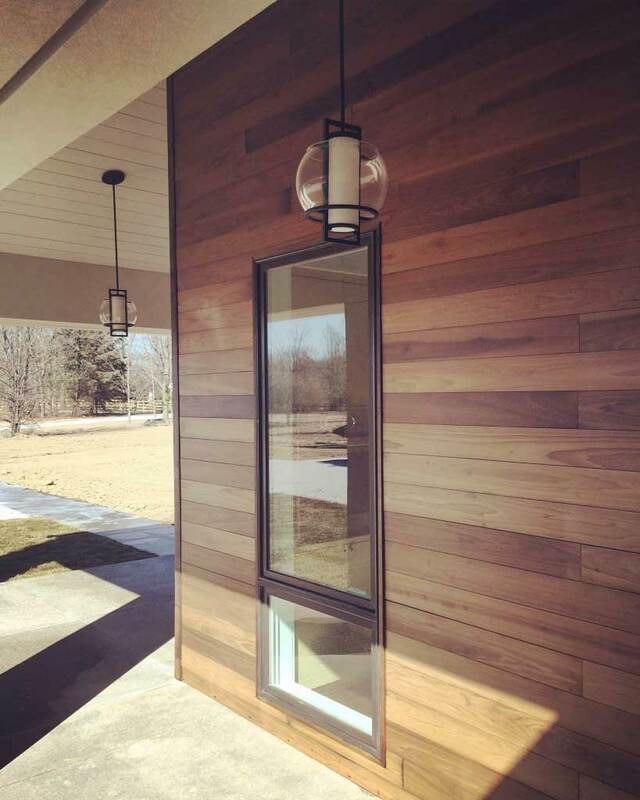 The thermally-treated wood cladding at Front Entry Porch was an Owner construction change on-the-fly. 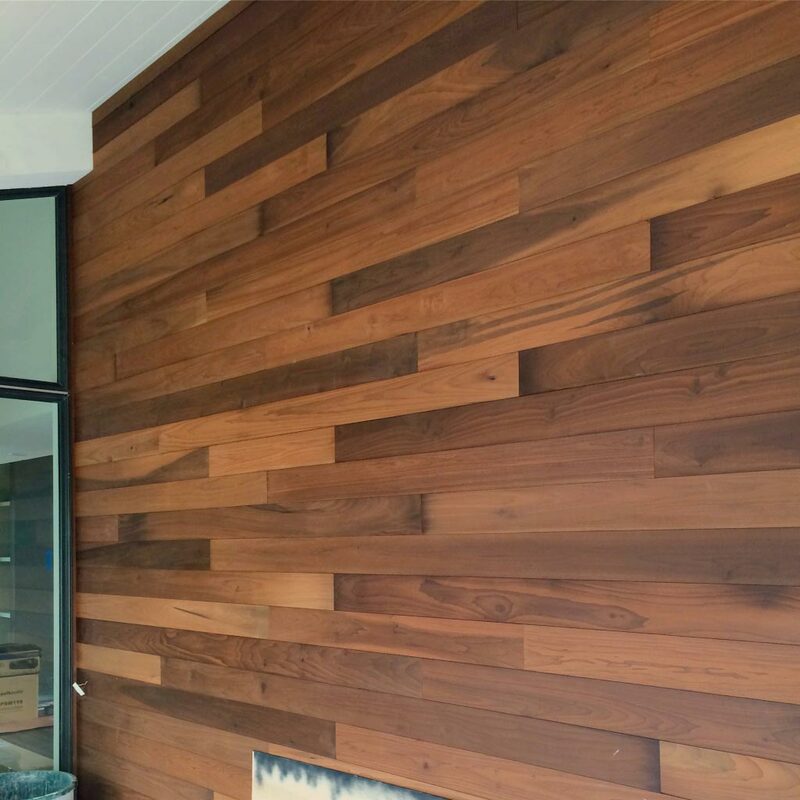 We originally designed this cladding as dark grey cement board in 6″ wide horizontally planks mounted on rainscreen wall system. This was part of the “grey siding ribbon” that was wrapping the Living Wing. Most of the grey siding was changed to the grey brick, but this area under the porch and running toward the Garage was changed to wood based on the Owner’s appreciation for the thermally-treated Ash at Copperwood. 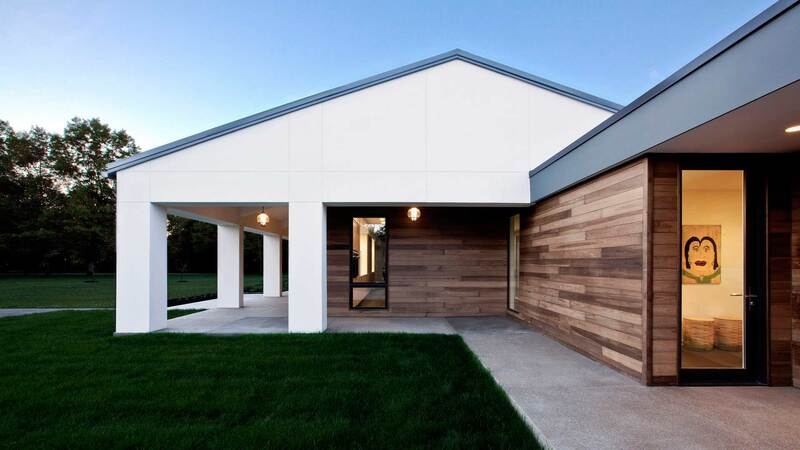 With this radical change to the original design-intent, Architect encouraged the client to give the wood siding a grey-tint. The idea was to maintain the design concept integrity and not have the appearance of too many materials being used. Instead, Owner opted for a natural thermally-treated wood finish with a clear-coat to maintain the appearance and not weather gray. The wood cladding is a nice-looking product (thermally treated Poplar). We are keeping an eye on how it will work with the overall composition. We hope this additional exterior material won’t be too busy. Overall, this porch looks fantastic in this photo, including the simple white beams and plank ceiling. 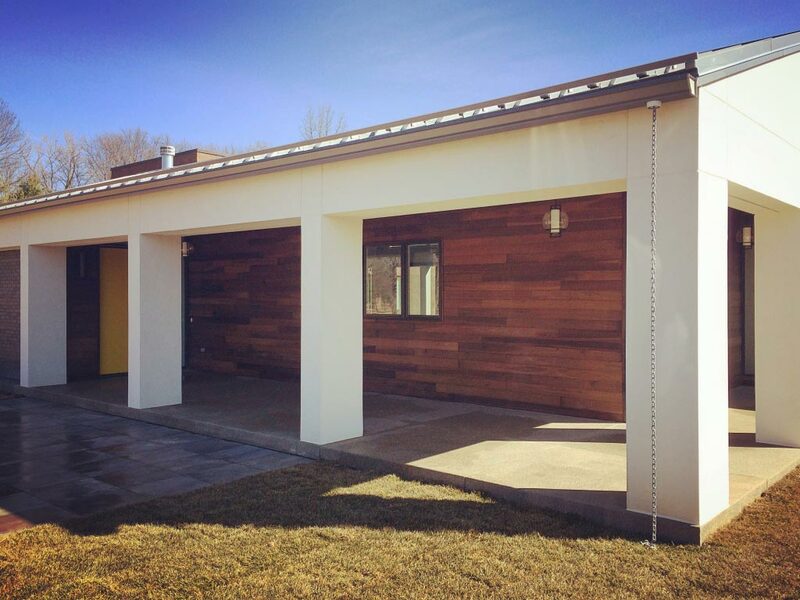 Rainscreen battens were not used and the wood siding is touching the concrete porch floor. We would have liked to advise on the proper detailing of these installations for longevity. Little details throughout could be better. For instance, with a little more attention to detail, team could have relocated or camouflaged the HVAC return-air grille visible through the entry door transom window. We have creative ideas for how to minimize the visual impact of mechanicals in circumstances like this. However, implementation of these micro-details takes the extra time and effort above-and-beyond a normal builder-lead approach and perhaps budget allowances. In the creation of architecture, how far to take the design and detail is always a balance. What prevails, quality, timelines, or budgets? Two of these three may be possible. 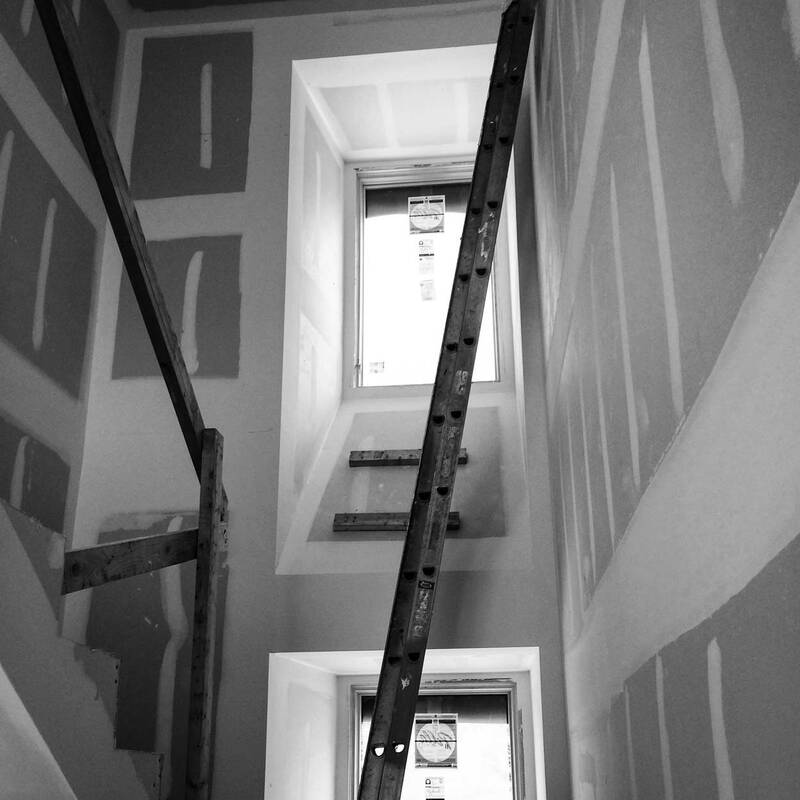 Here below is another view of the architectural stair in the bedroom wing. This is the only stair in the house and it connects all three levels. We attempted to make it an interesting, light-filled space. For the most-part, things came out as planned based on the 3D diagrams. We didn’t over-detail things here, and some things were left to the trades/builder to work-out basing decisions on similar decisions/budgets to New Modern House Treesdale, which had the same design and build team in-place. The stair + railing details could have used a bit more attention and follow-through with architect’s 3D concepts. But the final window, trim, and drywall details here came-out just right. 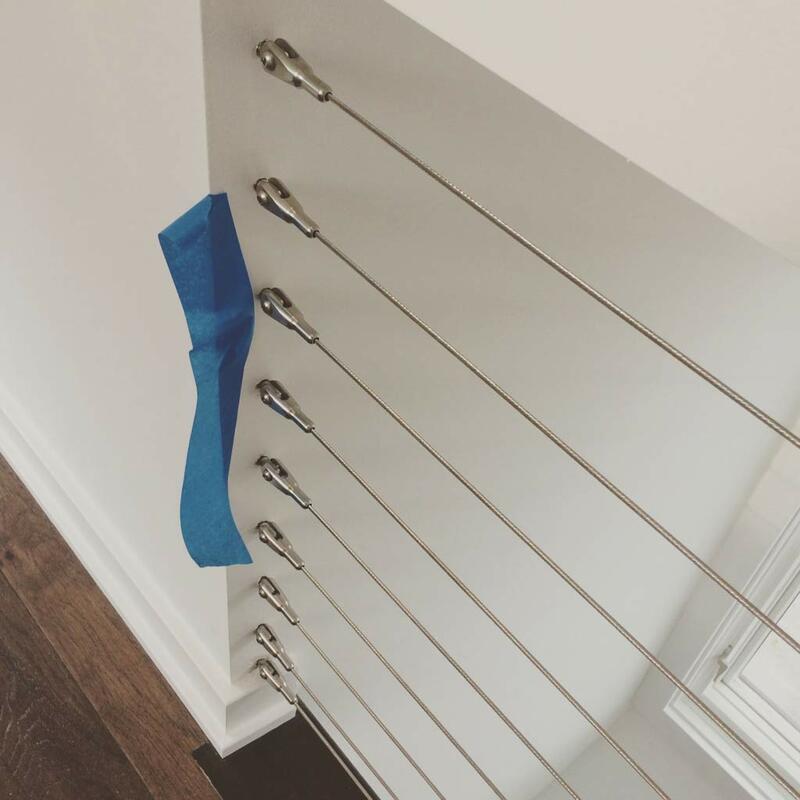 We detailed this cable-rail condition so the cables would anchor into a minimal wood trim. However, trim carpenters anchored them directly into drywall instead. This is a difficult detail to achieve and seems a bit unresolved. Floor trims and stair treads were to match the factory floor finish, but not quite a match. Landing detail at window to the left could have been more elegant with Architect assistance. Getting every micro-detail perfect requires a certain level of precision and team oversight. This usually translates into more time and cost. So, it comes down to Owner priorities to determine how far we take the details and definition of quality. Overall, this is a great project and team achievement and we are happy for the opportunity to have been involved. The integrity of the Master Bathroom design came though well – as did the related Kitchen area. Cabinet door-fronts were originally to be rift-cut white-oak, and replaced with light bamboo; overall a nice look. The cabinet run continues from this double vanity to the left into a make-up area. From there, the motif continues into counter-height Master Bedroom storage drawers. We are really happy how the original interior architecture design concepts have come to fruition. 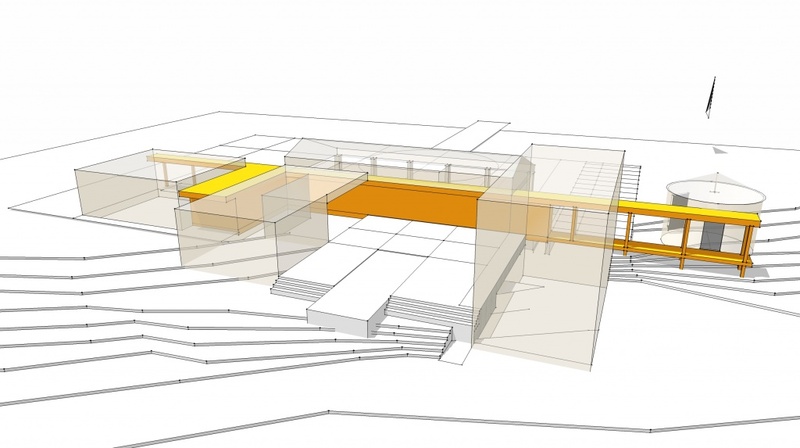 Architect had completed a comprehensive design vision (site, exterior, interior) before construction began. 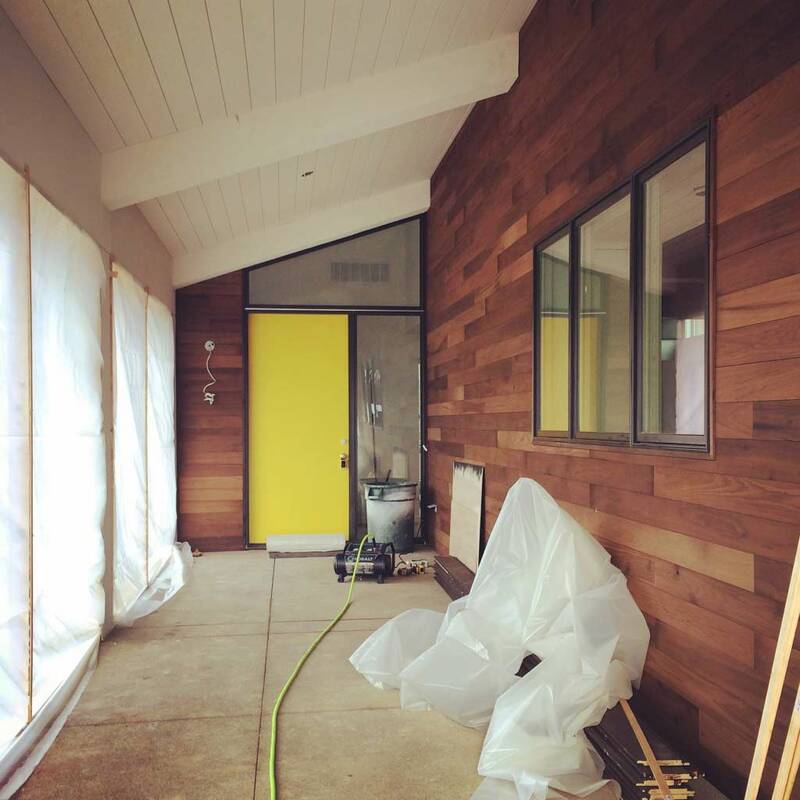 Early in the construction process, the team had started the interior finish selections process. At that time, Owner had expressed the desire to shift gears with some of the suggested directions (more finish-related items). 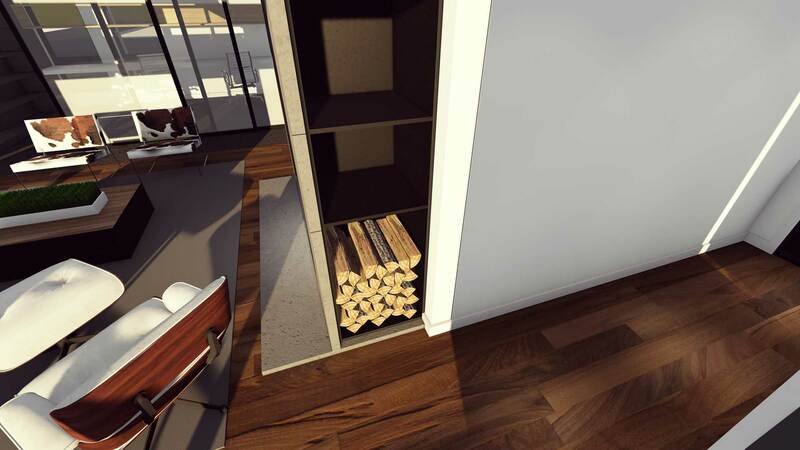 Owner preferred hardwood flooring throughout (instead of the large-format tile we proposed in living spaces). So since we ended-up with dark hardwood flooring throughout, we made some other adjustments. 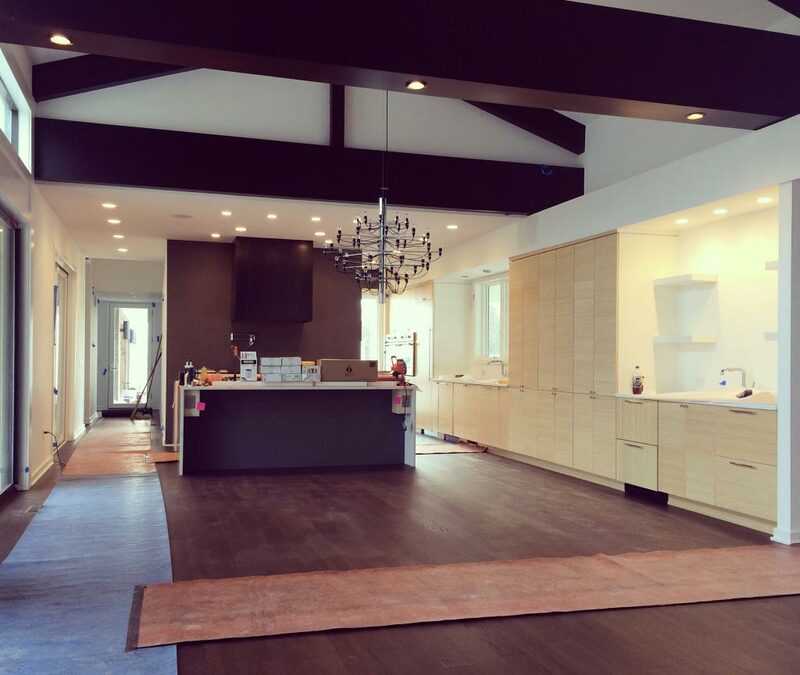 Beams shifted to darker wood to match floors, and ceilings became white drywall instead of wood. This did make the interiors a lot darker. Darker floor finish paired with turning the house away from the original solar exposure most certainly made a difference. 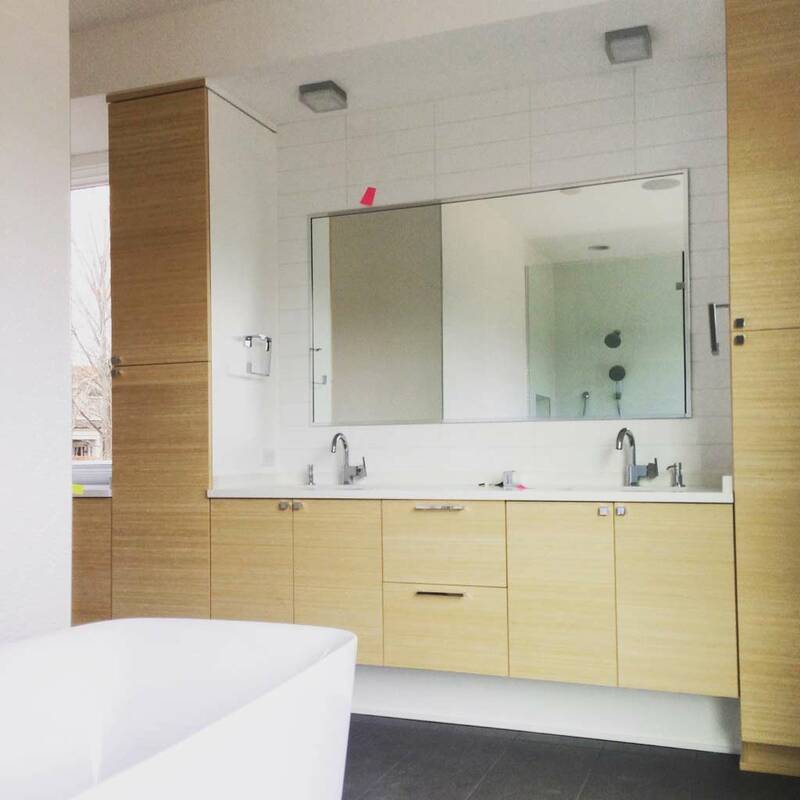 Cabinets changed from rift-cut white oak to a linear grain bamboo, which maintained the concept in those areas. As we had established the exterior and interior design concepts, we still needed to make all final interior selections. Owner expressed a desire to get assistance with interior furniture and furnishings, so HAUS recommended Tom Vriesman. From there, HAUS shared the interior vision documents. Subsequently, Vriesman took the reins on primary coordination of interior finish and fixture selections with Owner and HAUS collaboration. Team was respectful in staying-true to HAUS’ established interiors concepts (thanks, Tom!). Chris and Tom have worked together successfully on projects in the past and we speak the same design-language. The large 10′ wide by 8′ tall sliding glass doors by EFCO arrived and they look great. The team and owner debated the idea of reducing the size of these doors, mainly to save cost. We encouraged keeping the bigger doors. To the far right just past the kitchen island, one can see how 8′-wide doors would have looked (too small!). There were no local installations to inspect the EFCO commercial-grade sliding door product prior to ordering. Would doors be too heavy and difficult to operate due to their size and weight of the double-glazing? Builder visited an installation in St. Louis to advise on operation. As it turns-out, they are not ultra-light, but serviceable. Their lower price-point for that size door when compared to some of the smoother-operating more expensive products led to EFCO. As large, sliding glass-panel door continue to increase in popularity, more and more options are becoming available. Only time living-in and using the space will determine if this product was the right choice for the owner. 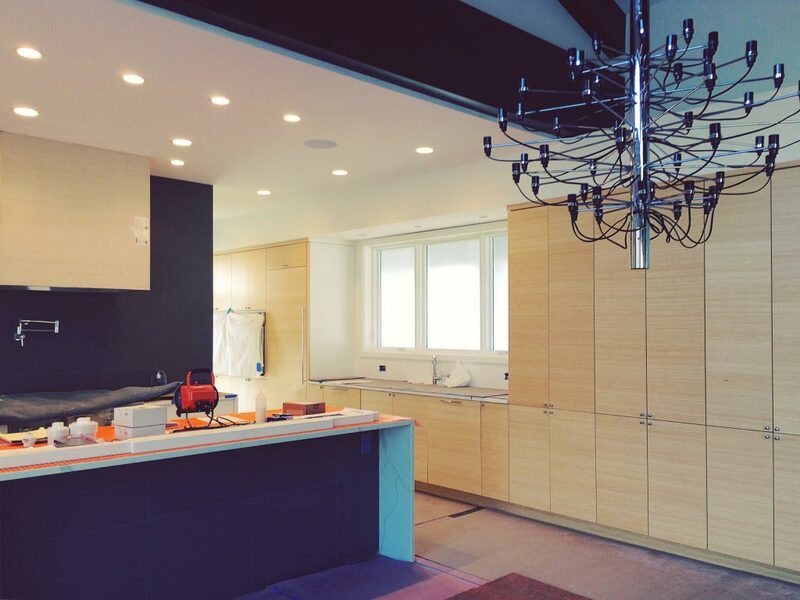 We had fun with the fireplace and kitchen island/cooktop/hood areas in the interior. The goal was to create an alignment, detail, and material relationship between these three interior features. 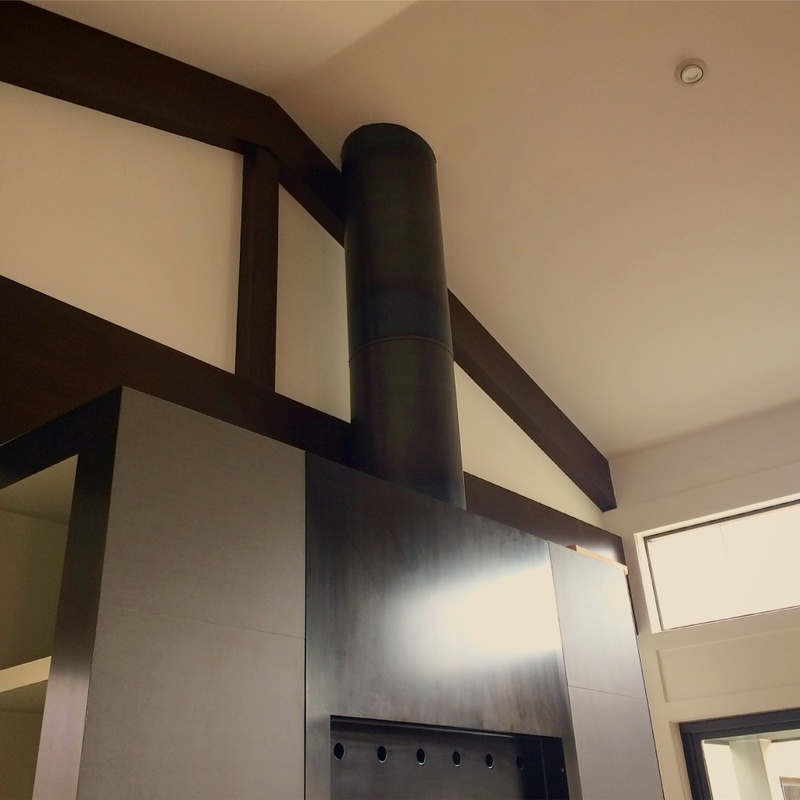 We utilized steel cladding to unify and camouflage the dark TV/Fireplace units. Then, we borrowed the same steel material to wrap the kitchen hood. Grey tile makes-up the difference, used on fireplace, kitchen island, and cooktop wall. Originally, we intended to use this tile on most floors. Sides of the fireplace incorporate storage cubbies for wood, books, and other items. We’ll be painting insides of cubbies a dark grey to more closely resemble the steel coloration. These are minimal/modern details that are tedious to achieve, but a difference-maker when accomplished. 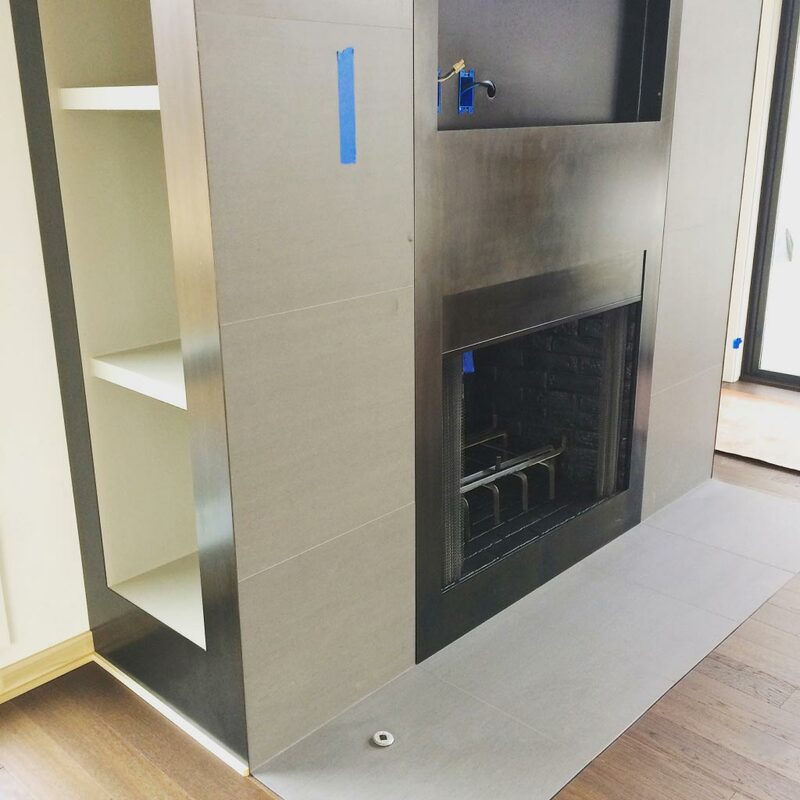 In the photo below, the steel cladding was to extend all the way down to the fireplace opening. So, we may see an adjustment there to the steel. Even with finish changes to the floors, beams, and cabinets, the integrity of the main living spaces came through well. 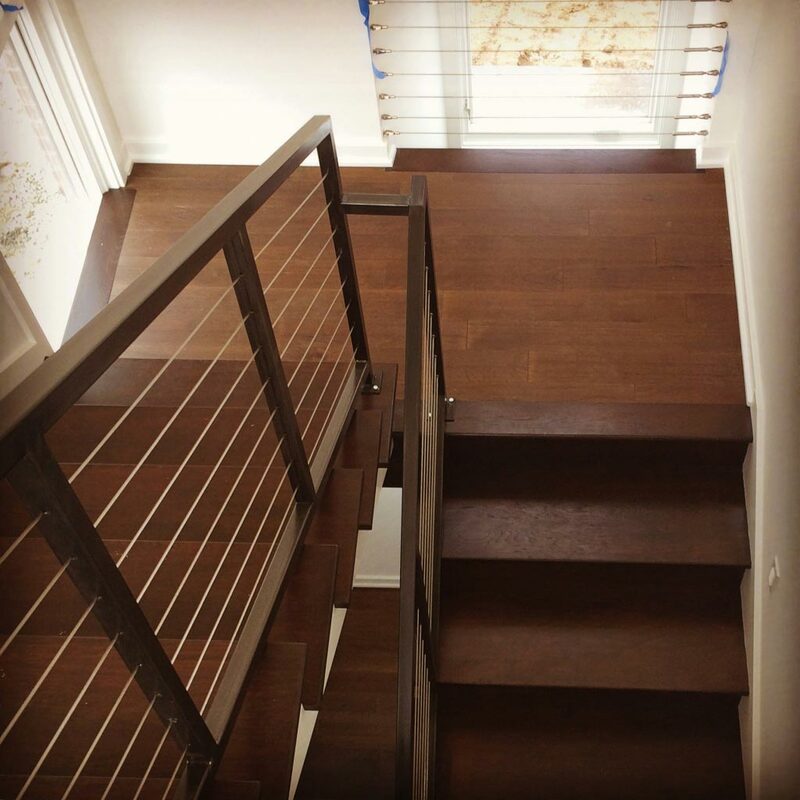 The beams came-out way darker than the floors, but what can you do at that point? The bamboo cabinets should be a good alternative to white oak and we hope they’ll remain as timeless. This open-concept layout includes a back kitchen that continues beyond the cooking wall to left of window sink. These back pantry areas are ideal to enable some dirtier behind-the-scenes work; a place to have the wall ovens, food storage, clean-up sink, and prep area. If things don’t want to be totally on display with an open kitchen, then a functional pantry serves that purpose. The space feels a little darkish, but the scale of the main living space probably helps. We designed special scupper details for conditions like this below; however, this actual installation isn’t what we designed. Without open runoff for overflow, debris may not run freely of the flat roofs. Team didn’t consult architect on these changes from design. Roofer should have provided shop drawings for architect review – c’mon people! The wood siding looks nice overall. Its introduction does add another level of complexity to the facade. We noticed here that siding touches concrete at base. For certain, we would have suggested raising base from concrete and incorporation of a rainscreen batten detail to properly weep water and ensure a longer-lasting installation. We certainly hope this detail doesn’t compromise siding longevity. We detailed the front gutter as box-style channel. It was to overlap the corner by 24″ or so to direct water and splash away from the structure. 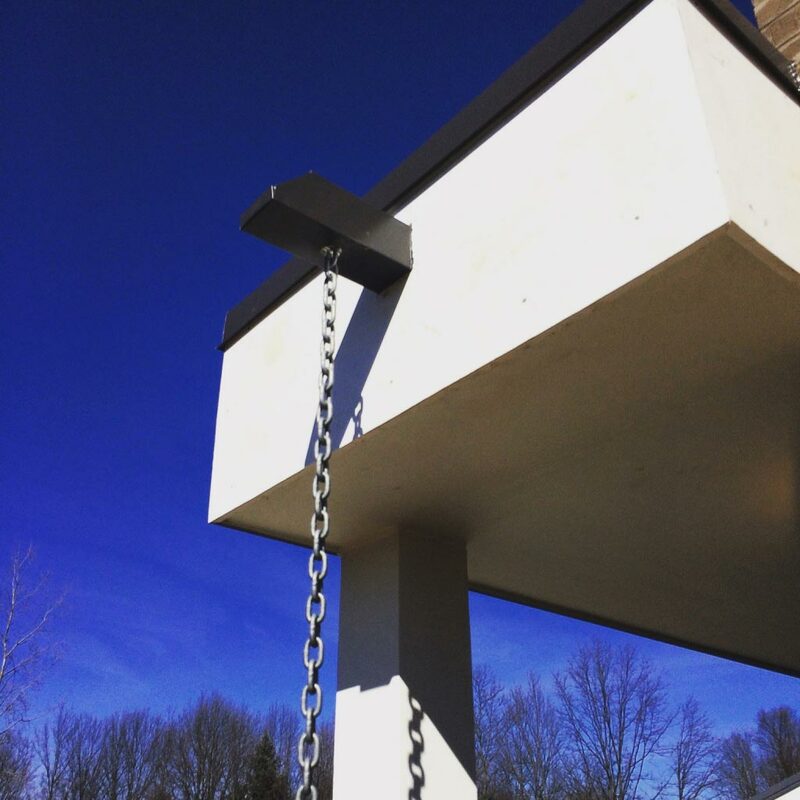 Build team installed an Ogee-style gutter instead with rain-chain alignment with column. Over time, the proximity and anticipated splatter may create maintenance issues at the now EIFS column. We aren’t sure why these original design details were not followed. Build team didn’t consult the architect. The answer would have been “not recommended”, with supporting rationale. Since we were out of the loop, we are left to wonder if budget drove these compromises. Or was it just an oversight? Again, on the construction projects we manage, these details get realized properly. We love the linear snow-guard bar. The bar and hardware is a good look. Owner moved-in to the home in late 2016, and furnishings are mostly complete by now. Most of the exterior landscaping completed in spring 2017, however it may take a few season for plantings to mature. We do not have a firm timetable for the Phase Two Studio addition, but believe it’s still in the plan. Overall, we’re grateful to have been involved on this excellent design opportunity; however, we are not satisfied with the overall process or the team dynamic. We hope to be able to finish the documentation/photography on the project in the future.